Need to get measurable results for your organization and get the most from your ActiveData for Excel investment? Want to learn how to practically apply ActiveData for Excel to top audit areas with a minimal learning curve? The guide provides sample data to test your skills prior to using "live" company data. It is a manual is to assist auditors, fraud examiners, and management in implementing data analysis routines using ActiveData for Excel. Use these techniques to proactively detect organizational inefficiency, ineffectiveness, fraud and provide measurable cash recoveries. 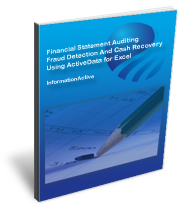 The book provides guidance as to which of the ActiveData for Excel's features can be used in an audit setting. It walks you through 16 common audit tests within the accounts payable, accounts receivable and general ledger audit areas. Armed with this document, users can no longer say that audit software is difficult to use. For now, even a tool as simple as a spreadsheet can and should be used as an audit software. With the “curtain exposed” users can now focus their time on the more critical activities of creatively dreaming up new tests and improving their business intelligence. The sample contains the table of contents, describes why to Audit Accounts Payable and shows one of the 16 tests that are in the full book. The purpose of this course is to assist auditors, fraud examiners, and management in implementing audit data analysis routines, and fraud detection and cash recovery techniques using ActiveData For Microsoft Excel. For accountants and auditors, Microsoft Excel provides a comfortable environment to work within and for many data analysis tasks, Excel can easily do the job. However when more complex data analysis and manipulation is needed, as is the case with fraud detection and cash recovery, more complex tools and techniques are needed. This is where the combination of Excel and ActiveData creates dramatic results. Please note that these materials require Adobe PDF Reader Version 6 or better and ActiveData Professional Edition Version 5.0 or later. To determine your version of the Adobe PDF Reader, select Help -> About from your reader. To get the latest version of the free reader, click on the button at right. To determine your version of ActiveData, use ActiveData -> Help -> About.